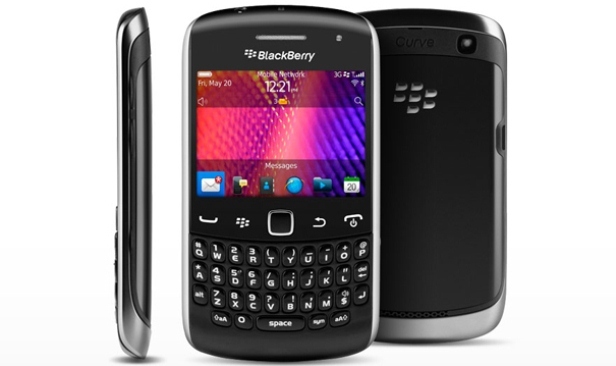 One of the oldest models from this brand, the BlackBerry Curve 9370 was launched towards the end of the year 2011. Very similar to its brothers – the BB Curve 9350 and the BB Curve 9360 – this one quickly became reknown for its performance and efficiency. Although a very good smartphone, it can sometimes be infected by viruses that will determine it to load the software very slowly, and generally not work as well as before. It’s recommended to perform a hard reset on the BlackBerry Curve 9370 in such situations. This procedure is very good in terms of getting users rid of all software-related issues very quickly, by refreshing the operating system and bringing the device back to factory settings. This also means that all user data will be deleted which is why it’s important to create a backup. This BB phone runs on v7.0 of its well-known OS, while it comes with a Li-Ion 1000 mAh battery and a single-core 800 MHz processor. Its internal memory can store up to 1 GB, but it is equipped with a card slot that lets you use a micro SD card – this one can store some other 32 GB of information. Coming with only one 5 MP camera situated in the front, this device can be used for recording videos, as well as taking pictures. As other similar models of BlackBerry Curve, this one is also easy to hard reset. There are two main procedures for doing so, but before moving on with the instructions, let’s see how you can create the necessary backup! To save all important files on the phone, you should connect it to the computer with the USB cable, and use the Desktop Manager app to transfer everything you wish. While the phone is turned on, press the Alt, Shift/Caps Lock and Del keys at the same time. Once the BB turns off, please release the keys and wait for it to restart. It will take up to 3 minutes for the reset to be done; don’t interrupt the procedure. Press the button in the middle to open the Main Menu, and go to Options. Scroll down to the Security option, and press the trackpad to select it. In a similar way, select Security Wipe, and check the boxes corresponding to the apps and data you wish to erase. 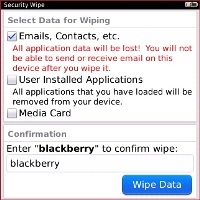 Enter the password: blackberry, and tap Wipe Data to confirm.